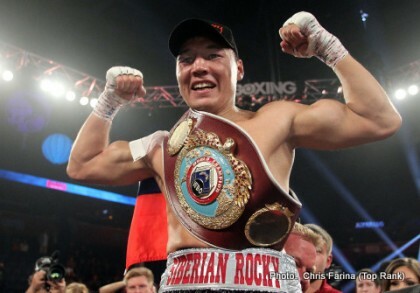 What Did Ruslan Provodnikov's Victory Really Tell Us? Ruslan Provodnikov scored a spectacular late round stoppage against Mike Alvarado tonight. It was something else. Provodnikov really looked up to the task. He was just brutal and relentless, and like a hungry shark hunting beneath shadowy waters, Provodnikov always seemed carried by forward momentum. A savage and consistent barrage of sharp hooks, crisp rights, and wicked body shots ultimately led to Alvarado’s demise. Provodnikov’s offense was running on all cylinders, and the surprisingly vicious outcome here helps to provide boxing fans with some new perspective for a couple of things. For starters, Timothy Bradley is looking pretty good right about now. When Bradley struggled against Provodnikov in what some considered a disputed win, people were highly critical of him especially since this followed his extremely controversial Pacquiao victory. Now within the span of a week, not only has Bradley soundly beaten the still formidable future Hall of Famer, Juan Manuel Marquez, but Provodnikov also stepped up and again made people take notice with his destruction of Alvarado. With the advantage of hindsight it now becomes clear that Provodnikov was a far greater opponent (and win) for Bradley than people then realized. Another thing this performance does is perhaps foreshadow things to come when Pacquiao meets Rios next month in China. Rios of course had two brutal scraps with Alvarado preceding tonight’s match, splitting those one win apiece. Were Alvarado and Rios, despite the obvious display of heart and courage, really as good as we thought? Or maybe their two battles were so engaging that each man lost something from all of the damage endured? Either way it forces us to reevaluate that upcoming fight in a new light. The story of Pacquiao-Rios probably comes down to how well Pacquiao bounces back from the brutal KO he suffered at the hands of his Mexican nemesis. If he can bounce back with the same type of punch resistance he used to have, then Rios should be tailor made for him. I think Pacquiao can and will bounce back, and I like his chances against Rios even more now than previously. Finally this fight obviously tells us something about Provodnikov and Alvarado. Both are warriors who can fight. When Alvarado somehow survived two difficult knock downs he suffered in round 8 tonight, he showed the type of guts and courage that every boxing fan can (and should!) admire. For Provodnikov he now had two outstanding performances in a row, and he is really proving that he is a force to be reckoned with. He just has amazing fighting instincts, and his punching technique delivers with mean intention. Provodnikov may not have the best skills, he sometimes seems easy to hit, and he often becomes winded for long stretches after making the mistake of overexerting himself, but he really is good at applying pressure and putting his punches together when attacking. He also must have learned a little something from his fight with Bradley because tonight he was applying pressure more intelligently. Great win tonight for Ruslan. You are here: Home / Boxing News / What Did Ruslan Provodnikov’s Victory Really Tell Us?